On 18 April 2019, MUT will launch two new academic programmes in the Faculty of Natural Sciences. The Advanced Diploma in Crop Production, and Agricultural Extension and Community Development programmes will be launched in the presence of the MEC for Agricultural and Rural Development, Themba Mthembu, a former MUT student. Part of the launch will be a press conference at the University where the leadership of the Departments of Agriculture and Community Extension and Agriculture will address the media on the two programmes, and the importance of planting the relevant and suitable plants. This will be followed by a visit to Swelihle High School, in Umlazi Township’s Section C, and eKhanana Old Age Home in the same section. Swelihle High School has been identified as a place where most of the agricultural activities will take place as it has large enough land, and it is also central. The Head of the Department of Community Extension, Eric Mthembu, will address teachers, principals and learners on the importance of Agriculture as subject to study at all levels, and as a source of food for both consumption and commercial purposes. Umlazi Township has 18% of schools that offer Agriculture as a subject. Some of the off-spins of the launch will be that the schools can put themselves in a position to produce enough agricultural produce to feed their learners. 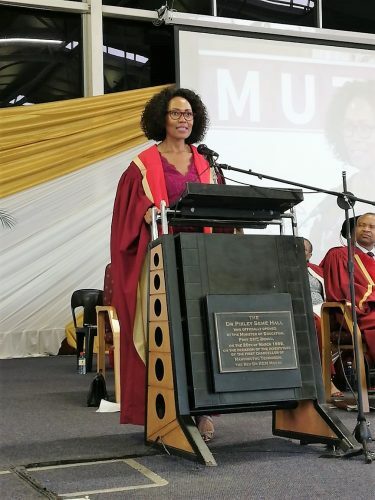 Speaking at the Mangosuthu University of Technology (MUT) graduation on Friday, 12 April 2019, Sindi Mabaso-Koyana reminded graduates that receiving a qualification was only the first part of the journey and that they needed more to succeed. Mabaso-Koyana explained to graduates that there were other qualities that they needed to learn for the world of employment and that it would have been easier if these qualities were taught at home. These qualities are advocacy, attitude, being an economic and social activist, emotional intelligence, entrepreneurship, integrity and ethical conduct, investing in yourself and value of abundance, not fear. 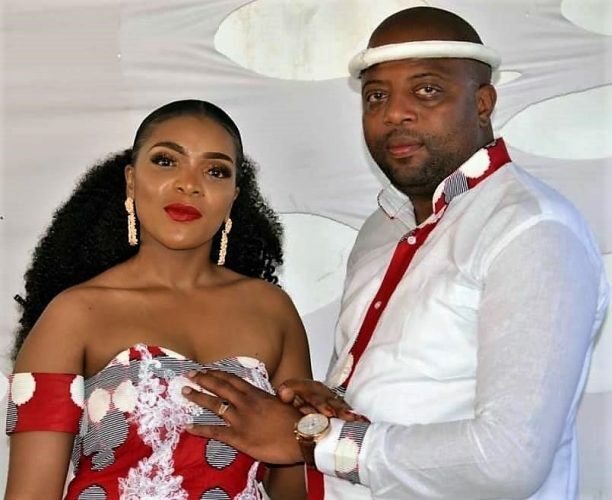 Mabaso-Koyana closed her addressed with a stern reminder that there is an abundance of business opportunities that graduates should take advantage of. “Go out there knowing that amidst the challenges of this world, this world is your oyster and presents a number of opportunities. “Approach the world and your daily life with an attitude that says: “There are so many life challenges to be solved. Which ones do I want to take on? Roll up your sleeves and shake off the sense of entitlement. 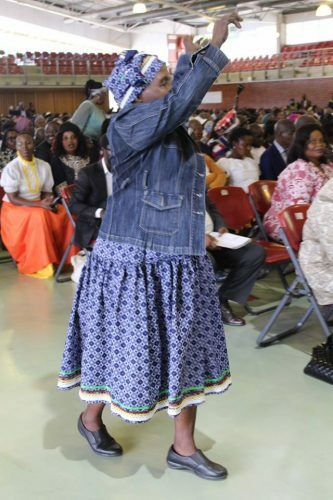 Let’s not scramble in trying to slice the pie into many pieces, but go out there and make many pies,” said Mabaso-Koyana. A call from 2675.2 km away was one of the most important calls for Joseph Kapuku Bwapwa, a Department of Civil Engineering academic. It was from his parents, Albert Kabantu, his father, and Therese Biakasasa, his mother. They wanted to congratulate their son for obtaining a PhD. 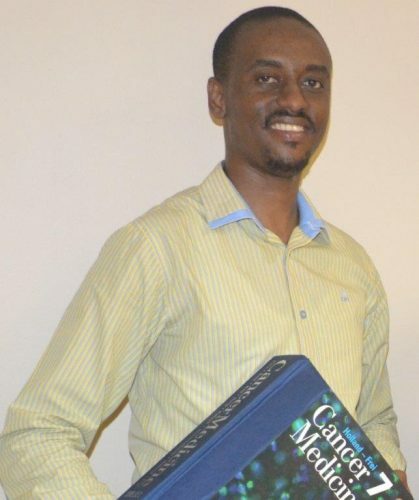 In his study, Dr Bwapwa demonstrated how algae could be used to produce jet fuel. 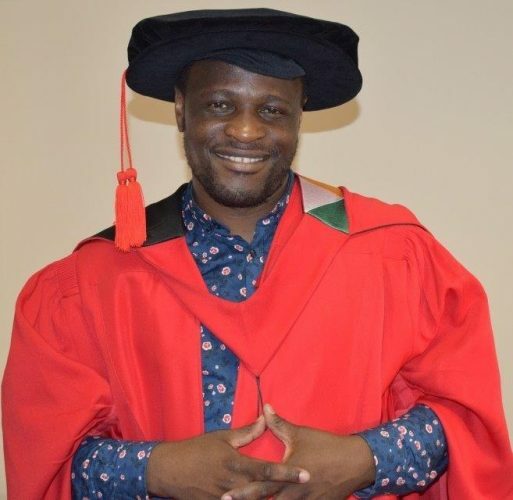 He graduated at the University of KwaZulu-Natal on 3 April 2019. “My parents were in tears. It was heart moving,” said Dr Bwapwa. Soon after his graduation, Dr Bwapwa’s brother posted his pictures on social media. Also, after Dr Bwapwa had given a talk to his students about the importance of studying further, the students used his photos as their profile pictures on social media. “I told them that they needed to believe that anybody could obtain a PhD. It is not for certain individuals. But you just have to work hard,” said Dr Bwapwa. He told the students that they should not let their backgrounds determine their future. This is a message that MUT Vice-Chancellor: Teaching and Learning, Prof Marcus Ramogale usually passes to MUT students. Dr Bwapwa’s promoter was Prof Akash Anandraj of MUT’s Department of Nature Conservation. The passing away of her husband did not dent Tholakele Khumalo’s zeal to put her children through university. 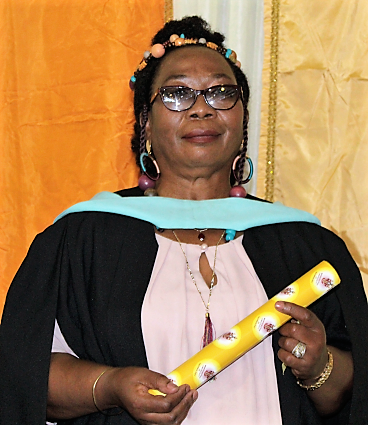 On 10 April 2019, Khumalo left Newcastle at 4am for MUT to see her last born son, Sanele, graduate with a Diploma in Chemical Engineering. 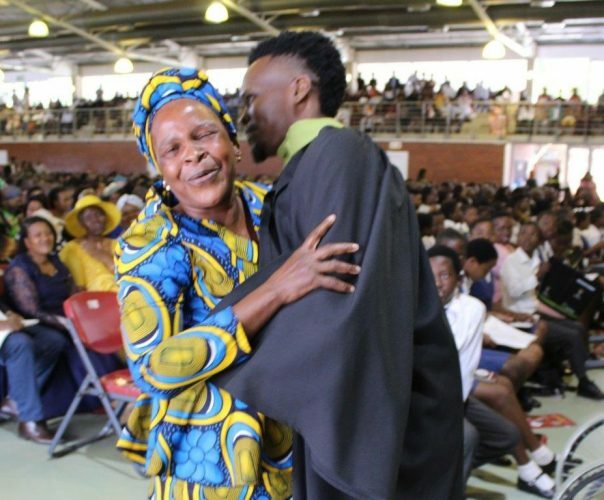 In tears after ululating and performing a Zulu dance up and down the narrow corridor in the Seme Hall where the graduation ceremony took place, Khumalo whispered into the ear of her son: “What would your father be saying if he was still around. My child I am so grateful.” As she said this Khumalo was receiving a tissue paper from one of the cleaners to wipe her teary eyes. She said her son showed her great respect, and did not take advantage of the fact that his father was no longer around. Sibonelo graduated at MUT with a Diploma in Mechanical Engineering. He has since furthered his studies through Unisa. Sibonelo now holds an M.Tech. 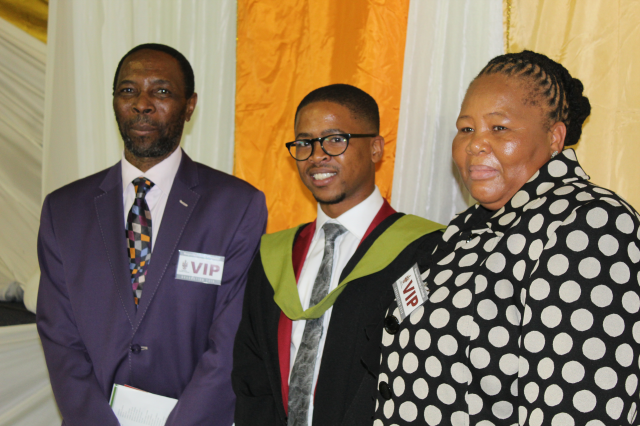 The MUT graduation ceremonies that will take place from 9-13 April 2019 will see three students from the Faculties of Engineering, Management Sciences and Natural Sciences receiving the Vice-Chancellor’s award in recognition of being top students in their respective faculties. Siboniswa Phakamani Thwala (Engineering), Gugulethu Cynthia Mkhize (Management Sciences) and Mthandeni Marvin Xulu will each receive a trophy and a R5 000 cheque at this year’s graduation as part of the VC awards. Thwala got an overall average 83%, while Mkhize and Xulu sat on 82% and 80%, respectively. 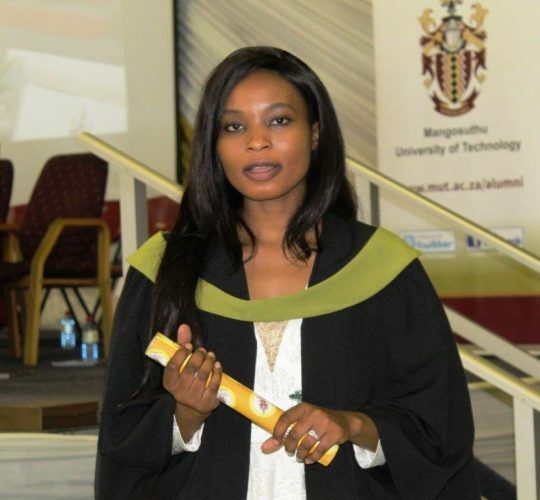 Commenting on her overall performance, Mkhize attributed her academic success to the goal she sat herself when she first arrived at MUT. The practical test that Mkhize refers to were computer-based and her struggle stemmed from only learning to use a computer at MUT. “At school I never used a computer; first year [at MUT] I could barely type. That is why I got 66%, 71% second year and 79%,” she said. Mkhize now works as an Intern at the MUT Marketing and Communications Department and is a Residence Assistant in one the University residences. 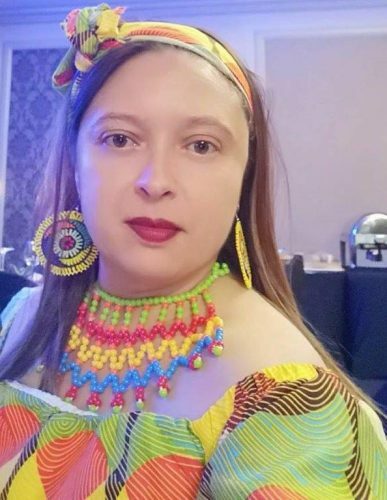 She will graduate with a National Diploma in Office Management and Technology on Thursday, 11 April 2019. 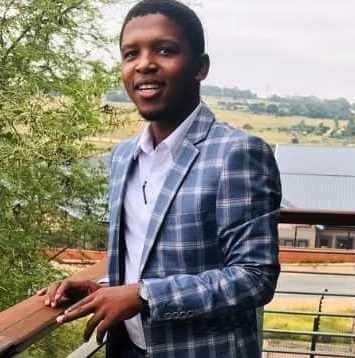 Xulu, who is now reading for a BTech at the Durban University of Technology, said the award will inspire him to perform even better in his studies. For Xulu, his performance stemmed from the desire to do better than he did in high school. He was expecting even more in the way of recognition for his performance. He believes that the trick to performing better lies in setting a target, having a studying strategy and most importantly, studying consistently. 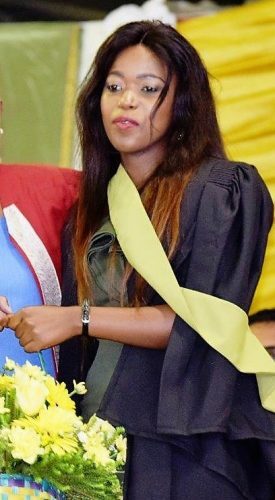 Xulu will graduate with a National Diploma in Information and Communication Technology on Saturday, 13 April 2019. 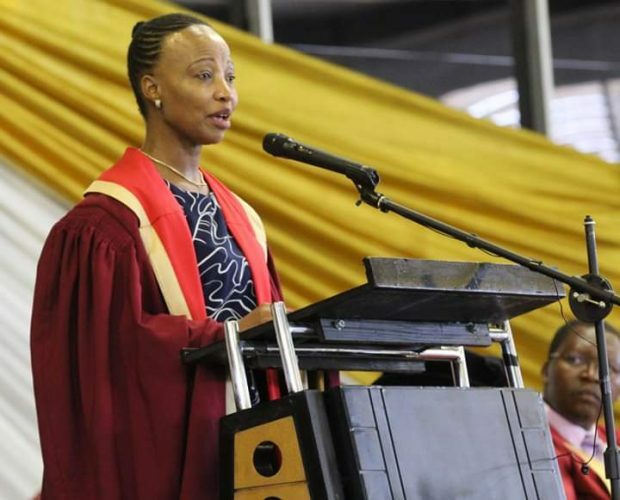 About 2617 students will be capped at this year’s Mangosuthu University of Technology (MUT) graduation ceremonies, which start on Tuesday, 9 April ending on Saturday, 13 April 2019. The ceremonies, which will be held at Dr Pixley Seme Hall at MUT, will also honour four South Africans who have made significant contributions to the lives of South Africans through their service. These individuals are Ms Monde Monyake, Surveyor-General and first African woman to hold this position in the province, KwaZulu Natal Province; Dr Phumla Mnganga, Managing Director: Lehumo Women’s Investment Holdings; Sindi Mabaso-Koyana, Chairperson of the African Women Chartered Accountants Investment Holding Company and Chairperson of Advanced Capital and of the Advanced Group of Companies; and Professor Sunil Maharaj, senior professor in the School of Mathematics, Statistics and Computer Science at the University of KwaZulu-Natal. Graduation will run for five days. The Faculty of Engineering (Departments of Civil Engineering & Survey and Mechanical Engineering) will kick-start the ceremonies on Tuesday; setting the tone for the Departments of Chemical Engineering, Electrical Engineering, Construction Management & Quantity Surveying which wrap-up the Faculty of Engineering’s ceremonies on Wednesday, 10 April 2019. The Faculty of Management Sciences will take to the stage on Thursday, 11 April and Friday, 12 April 2019. 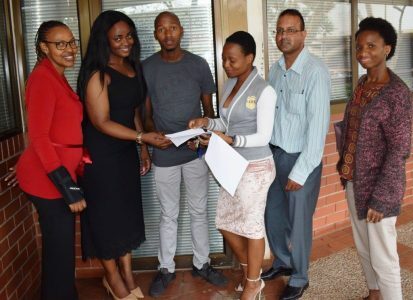 Students in the Departments of Human Resource Management, Marketing and Office Technology will graduate on Thursday, while their colleagues from the Departments of Accounting & Public Management will get capped on Friday. The last ceremony, which takes place on Saturday, 13 April 2019, is reserved for the Faculty of Natural Sciences. This ceremony will also see six Master’s students receive their qualifications. The parents of twins, Ziningi and Zinhle Mbona cannot wait to come and see their daughters ascending the stairs at MUT, and hearing Prof Chandra Jinabhai, the Acting Dean in the Faculty of Management Sciences, calling their names. Ziningi and Zinhle will be graduating with the Human Resources and Management Diploma on 11 April 2019. It is only then that the parents will believe that their last born children will be graduating. The twins said their hard work was made a little lighter by the fact that they were studying the same programme, and worked together as a team. “We had other students studying with us. But we were mostly on our own,” said Zinhle, the less-reserved of the two. The KwaMashu girls agree that what they achieved was not usual. “In most cases twins would not go this far. At least one would progress, while the other would show less interest in studying. We kept our focus,” said Ziningi. They both said they could barely wait for their graduation day. “We are not sure if we will be able to sleep on the 10th. That is how excited we are about graduating, the outcome of our hard work!” said Ziningi. The twins have a separation anxiety. They fear that graduation excitement will soon be replaced by separation as they are likely to secure jobs at different places. They do not have the experience of being apart since they met in the womb. However, they both think that regular communication will smoothen the rough experience. 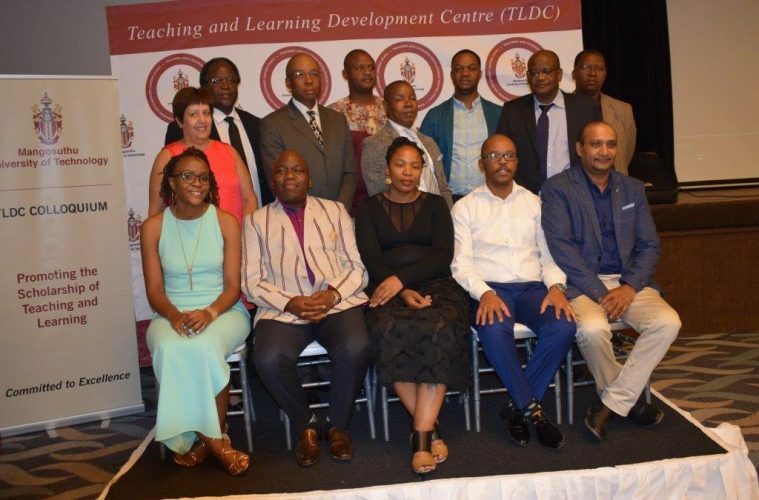 Eight Mangosuthu University of Technology academics and three students were awarded at this year’s Teaching and Learning Development Centre’s (TLDC) Teaching and Learning Colloquium, which started on 27 March 2019 and ends today (29 March 2019). Winners were recognised in the following categories: Best Established Teacher: Gold Award, Best Established Teacher: Silver Award, Best Established Teacher: Bronze Award, Best Established Teacher: Silver Award, Best Established Teacher: Bronze Award, Best Emerging Teacher Award and Best Students in the Faculties. The Colloquium, which was themed Re-imagining the Purpose of Higher Education for Social Justice, saw guests from various institutions locally and in the United Kingdom present papers in various topics related to learning. The two keynote speakers; Prof Monwabisi Ralarala, Director of the Fundani Centre for Higher Education Development (CHED) at the Cape Peninsula University of Technology and Chairperson of the African Language Association of South Africa (ALASA), and Professor Rajani Naidoo, Director of the International Centre for Higher Education Management at the University of Bath in the United Kingdom; focus on language in knowledge development and dissemination and how universities contributed to social injustice respectively. The Awards continued to scan the entire MUT academic field; the winners included three students, one per faculty. The students were judged based on their 2018 final examinations, which was their first year. 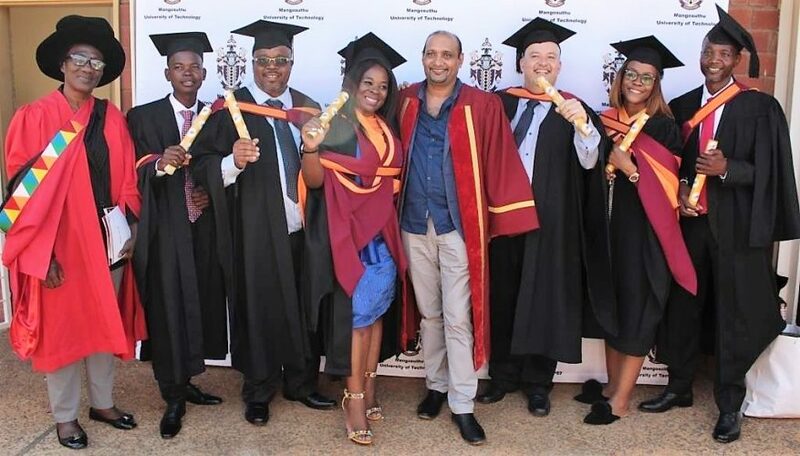 The top achieving students per faculty were Ntando Khuzwayo, a second year Accounting & Public Finance student, Phila Dlamini excelled in Information Communication Technology (ICT), while Vuyiswa Mazibuko of Electrical engineering toped the engineering faculty. All the students were awarded a sum of R7 500 each. This cash will be deposited into the MUT student accounts. Khuzwayo said she took all her tests seriously as she built towards the final examinations. “I also worked with groups. I would ask my classmates the questions on things I did not understand,” said Khuzwayo. 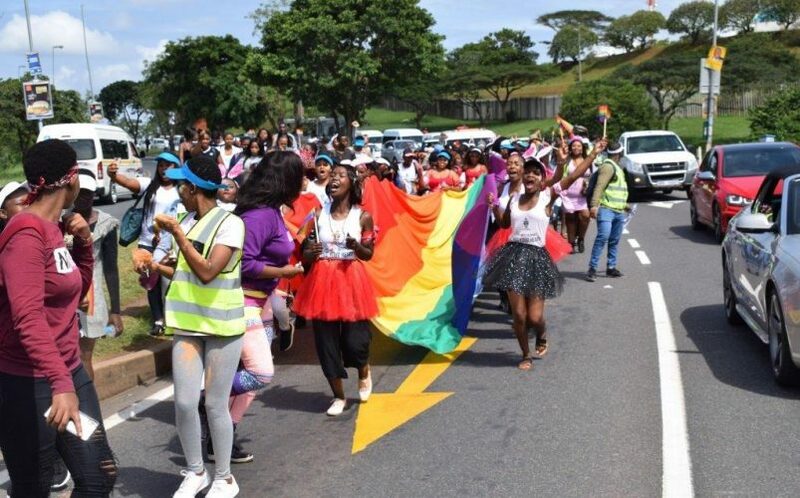 Mangosuthu University of Technology (MUT) has organised a Rainbow Parade aimed at promoting tolerance and acceptance of people living with disabilities, albinism and members of the Lesbian, Gay, Bisexual, Transgender, Queer or Questioning and Intersex (LGBTQI) community. The parade will start outside MUT’s main entrance (511 Griffiths Mxenge Highway, previously known as Mangosuthu Highway), and proceed to make a U-turn at the traffic lights by KwaMdladla Butchery. Staff and students will then march back, pass the MUT main entrance, then turn left into Inwabi Road before turning left into the Dr Pixley Seme Hall entrance where the parade will end. Participants in the parade will be guided by 20 marshals who will be wearing reflector jackets. Marshalls will also provide participants with water during the parade. Ambulance services will be available to take care of any medical emergencies during the Parade. Members of the media should contact Bheki Hlophe on 031 907 7195 or email hlophe@mut.ac.za for interviews. 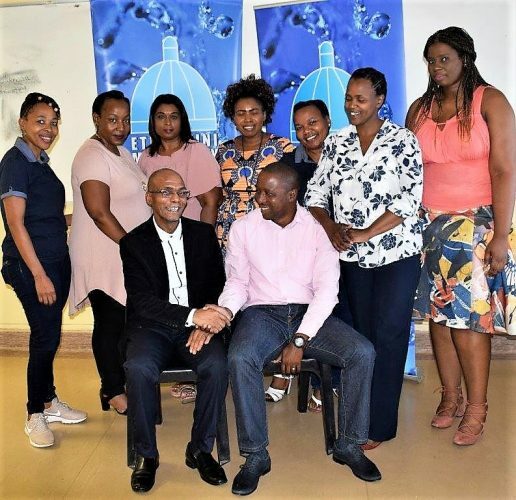 As water continues to be a scarce resource around the world, Mangosuthu University Technology (MUT) and the Department of Health, Umgeni Water, and eThekwini Municipality joined forces to commemorate National Water Week. At the event, which was hosted by MUT’s Department of Environmental Health on Tuesday 19 March 2019, all parties harmoniously sent out a strong message that water was a fundamental human need and played an essential role in all forms of life. The event was hosted to commemorate the International Water Week which is commemorated through a series of events in South African and the rest of the world. The 2019 International Water Week is commemorated from 18 March to 24 March. 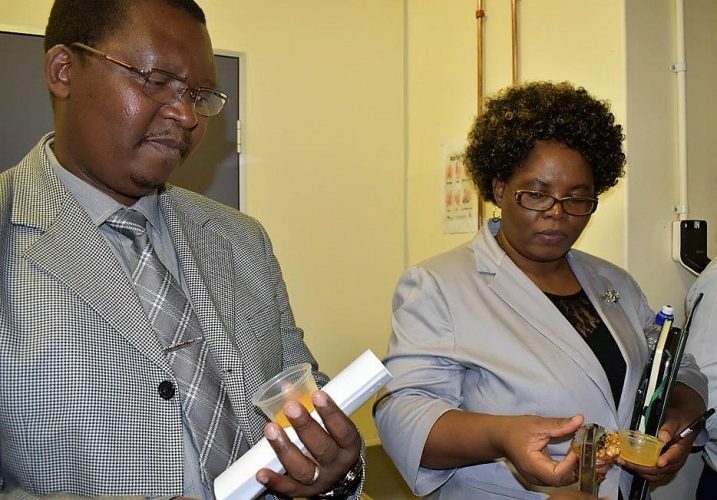 Commenting on the importance of water as a scarce resource that needed to be well looked after, Thulisile Mtshengu, Lecturer in the MUT’s Environmental Health department, said water was essential for the people’s health, food production, and the environment. “What makes water even more important is the fact that South Africa is a water scarce country receiving around half of the global average annual rainfall. This fact is exacerbated by an escalating demand due to economic and population growth, urbanisation and rising standards of living, unsustainable use and high levels of wastage and loss, as well as increasing pollution which renders water unfit for use,” said Mtshengu. 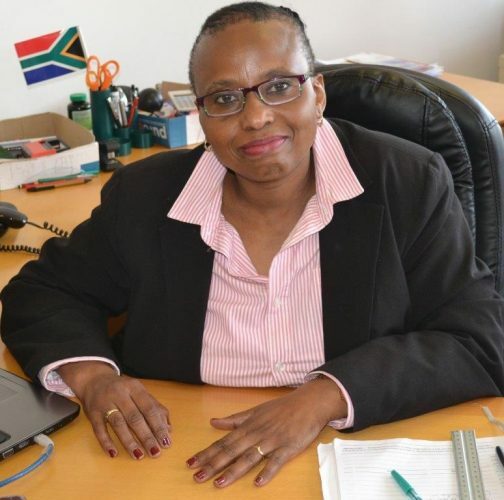 Thulisile said the objectives of the National Water Week were “to strive through a collaborative effort and active engagement of government departments, private companies, academia, community members and stakeholders in the sector, to find solutions to water conservation, pollution, climate change, as well as floods and droughts”. Over the years the importance of water and its scarcity has been highlighted by the fact that the United Nation’s General Assembly on 22 December 1992 adopted a resolution to declare 22 March of each year the World Water Day. This day is observed annually and focuses on the importance of freshwater and advocating for the sustainable management of freshwater resources. The UN aims to ensure that everyone in the world has access to safe water by 2030. The UN goal was further emphasised at the event by Belinda Makhafola of the Department of Health when she said that the 2019 slogan for the event was “leaving no one behind”, and it aimed at reducing inequalities in access to safe and reliable water supplies for all. In an attempt to equip new students with the necessary foundation to enable them to adapt to life at residences and cope with the shock of having to share living spaces with other fellow students, the MUT’s Student Housing Unit hosted this year’s residence orientation on Saturday, 16 March 2019 for students residing at the on-campus residences. Ndlelenhle Jiyane, a warden in one of the main campus residences, said the aim of the Orientation was to give the students a head start. 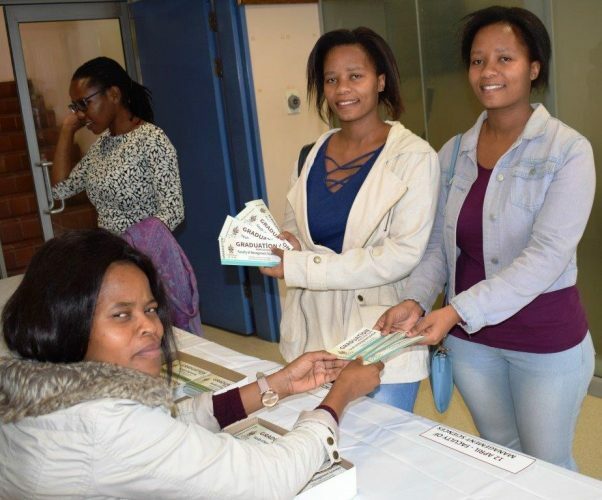 “A number of divisions at the University descended upon our Seme Hall to give students information on security at residences; NSFAS informed the students about finance-related issues, while the Student Housing Unit explained the rules applicable at the University residences. The general idea for this orientation was to make sure that students were informed, so they would know, and then behave accordingly,” said Jiyane. 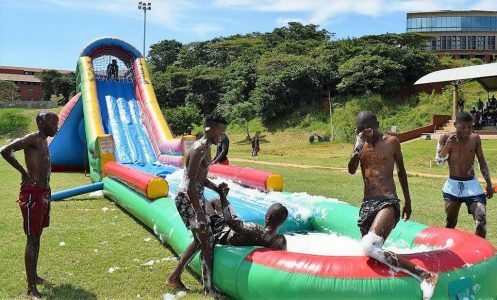 The lighter part of the event gave new students a chance to socialise and get to know one another better.. Fun and games were staged at Seme sports grounds. “We wanted to give our students a chance to be young again. This will contribute a long way in making MUT a home away from home and would be part of the students’ campus life. Also, any form of play and exercising contributes to living a long fulfilling life, as research says,” said Jiyane. Students had a time of their lives as they played with big ‘toys’ that turned the MUT sports ground into a giant playground. Nkanyiso Shozi, a first year Nature Conservation student, said he knew life at the university was different. “What I saw at MUT went beyond my expectations. Back at high school we did not have such a variety of sports and games; there were only soccer and netball. When a lot of sports like hockey, rugby and volley ball were introduced to us at the orientation, I was super excited and felt like joining every part of the sports. I am so glad that I am part of the University that cares about the students well-being. I love the fact that they reminded us of the fun we used to have when we were kids by having the fun games in our orientation. I really felt like a kid again,” said Nkanyiso.